Slice the polenta 1 centimetre thick. Cut each slice into 4 little wedges. Heat a wide nonstick skillet. Add a drop of the oil and spread it around with a paper towel to create a very light coat, or use cooking oil spray. Add the polenta wedges; cook in a single layer over medium heat, about 5 minutes on each side. Remove the polenta to a plate. Heat the oil and soy sauce slowly in the same skillet. Before they get too hot, add the seitan and stir well. Raise the heat to medium-high and sauté, stirring frequently, for 5 minutes. Stir in the bok choy, spinach and scallions, then cover and cook until just wilted, 1 to 2 minutes. Sprinkle in vinegar to taste. 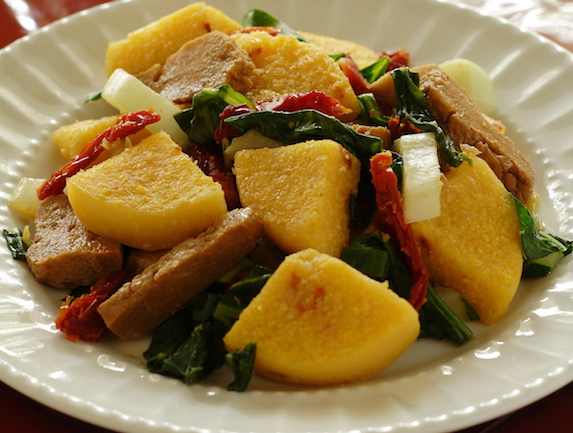 Gently fold in the polenta wedges and dried tomatoes. Season with salt and pepper and serve at once. Recipe courtesy of Nava Atlas of Veg Kitchen.